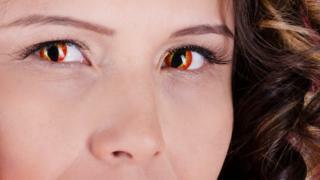 Eye experts are warning of the risks of wearing novelty contact lenses at Halloween, saying they can cause nasty infections and scratches to the eyes. Cosmetic contact lenses are often sold in joke and fancy-dress shops and on websites, but they come without instructions on safe use. Eye-health professionals say novelty lenses should never be shared, stored in tap water or kept in overnight. In extreme cases, this can lead to impaired vision and sight loss. The Association of Optometrists said its members often saw people with eye problems after wearing novelty lenses. It said partygoers should wear only lenses sold with the supervision of a registered eye health professional. Mr Badrul Hussain, a consultant ophthalmic surgeon at Moorfields Eye Hospital, said he treated patients every year, including children under 16, who had developed eye conditions after wearing the contact lenses. He said eye problems tended to increase around Halloween. "Some of the cases we see, like patients sharing lenses with friends, wearing the same pair year after year well past the expiry date, and storing them in tap water, have devastating effects," he said. "Not knowing the basics of using contact lenses safely can put you at higher risk of developing painful eye injuries and, in the worst cases, risk of permanent sight loss."